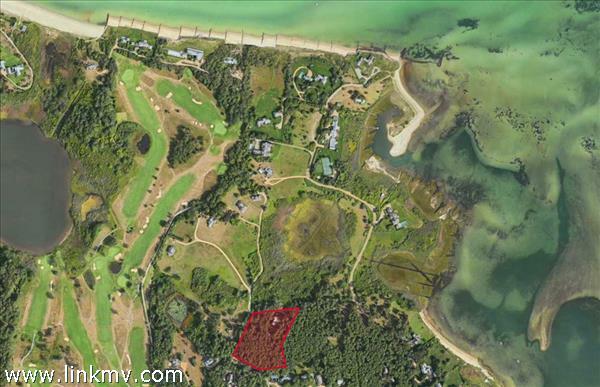 NORA'S MEADOW: LUXURIOUS LIVING IN EDGARTOWN. 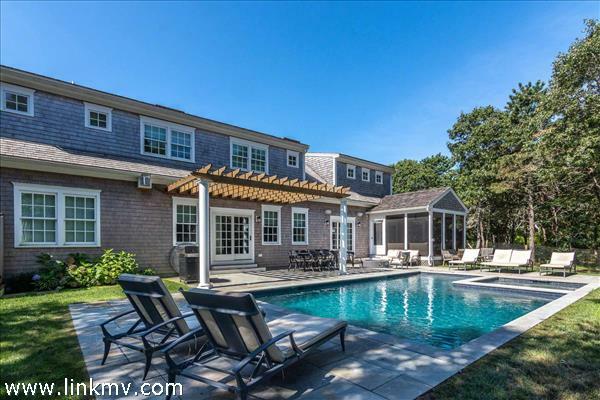 With its fresh coastal-inspired design, this recently built custom home in Nora's Meadow features a modern layout that is perfectly styled for indoor-outdoor summer living and entertaining. The dramatic Living Room features a vaulted ceiling and is anchored by a handsome gas fireplace and custom built-ins. The spacious Dining Room can accommodate a 10-foot table and the gourmet Cooks Kitchen features a large center prep island plus beautiful white cabinetry, Carrara marble countertops and top notch appliances (SubZero®, Viking® and Bosch®). 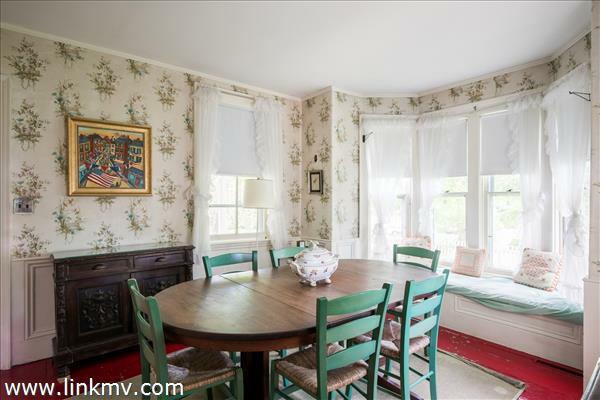 There is also a casual dining alcove with access to a large screened porch. The open-designed living areas feature an entire wall of windows and French doors that open out onto the outdoor living/entertaining space with bluestone terrace highlighted by a pergola and fire pit -- plus a heated gunite pool with Pebble Sheen® finish and built-in whirlpool spa. 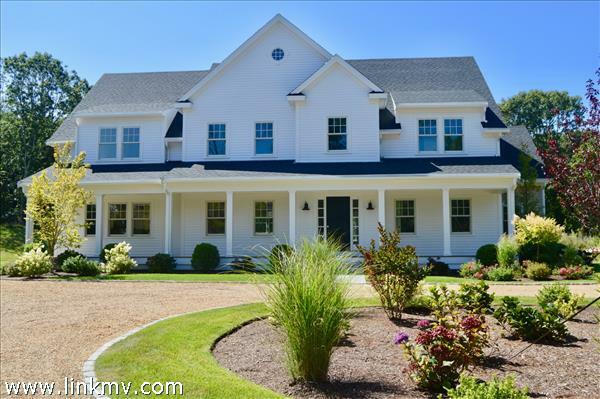 This spacious and bright home features a total of five bedrooms including a luxurious first-floor Master Bedroom suite with a spa-inspired bathroom and large walk-in closet The existing 6-bedroom septic system allows the ability to build a detached Carriage House with bedroom/bath above. 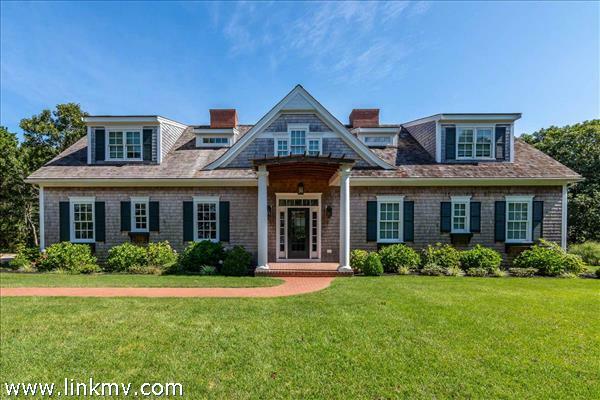 Nora's Meadow offers a unique blend of country living just a short stroll or bicycle ride to Edgartown Village. Furnishings and contents are available separately for a turnkey purchase opportunity. Note: There are rentals in place for Summer, 2019; Seller is open to a closing date at the end of the summer rental season. 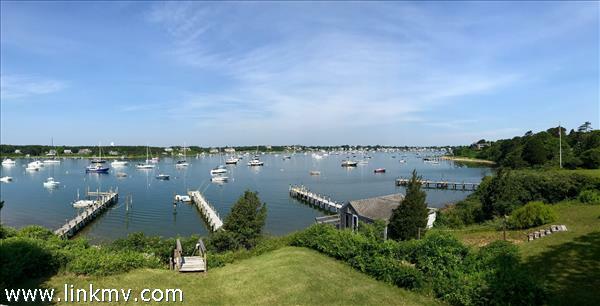 Remarkable waterfront property with deepwater dock on the Chappy side of Edgartown Harbor. Distance is less than a mile to the Chappy ferry. The water views extend from the village waterfront across the inner then outer harbor all the way to South Beach. 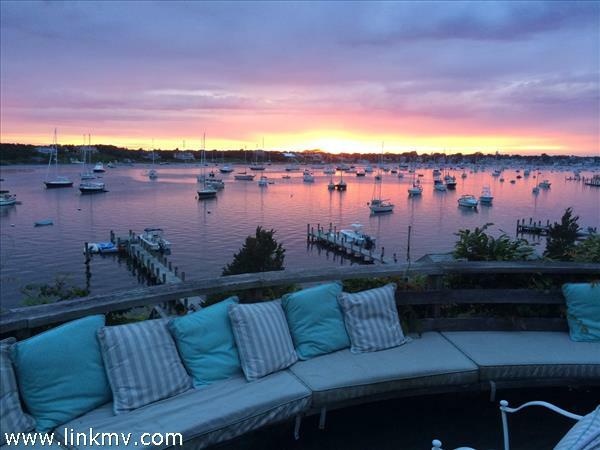 Everything in-between is a front row seat to one of the most scenic waterscapes on the eastern seaboard. 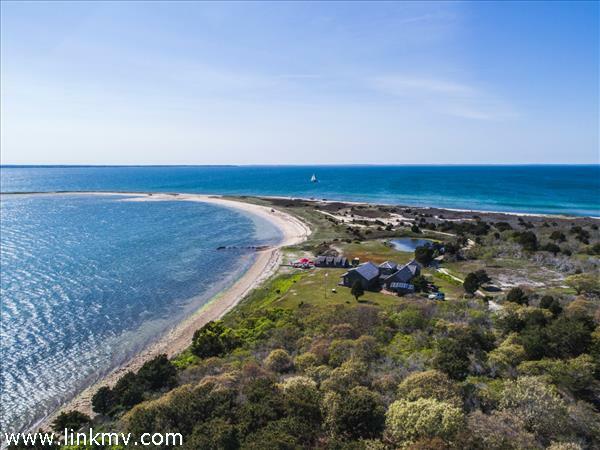 This is an incredibly active view and you can watch multimillion dollar wooden boats under full sail, teens taking the Whaler for a ride with their friends, kayakers and paddleboarders weaving between the moorings, and oystermen harvesting their catch. You might also spot your spouse or one of the kids returning from the village - taking the short cut by just motoring across the harbor instead of driving or biking to the ferry. The draft at the end of dock at low tide is 5’4” deep. It is one of the longer deep water docks with attached floating dock and swim ladders. The three-level home takes full and creative advantage of space. The main level features an open living and entertaining area with water views everywhere you look and a full kitchen and dining area. The design flair is exemplified by the fireplace which is a folk art masterpiece. The main living area transitions seamlessly onto the 400 sq ft mahogany deck that is partially shaded with an awning. 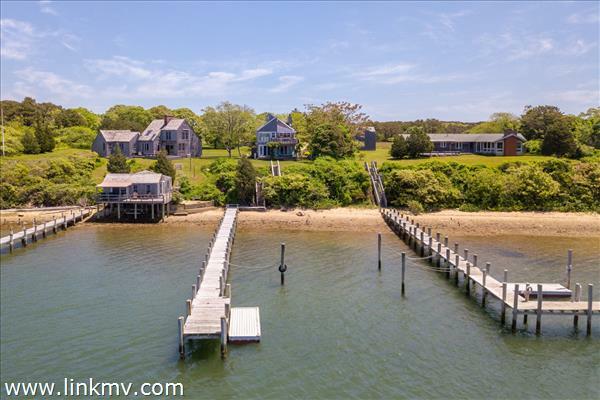 Here is where you can soak in the incomparable waterviews with a cup of coffee before anyone else wakes up, or with all your friends enjoying cocktails at sunset. In total there is 1000 sq ft of decking. 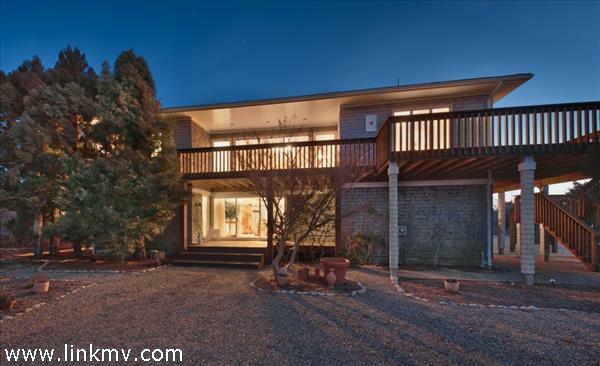 There are two bedrooms on the ground level, both with decks and large water views. The master bedroom has a bathroom ensuite and the guest bedroom has a full bath adjoining it. On the third level there is a cozy bunk room with a half bath. The nearby bunkhouse is as charming as can be. It sleeps two people comfortably and is perfect for overflow guests or kids who want the adventure of sleeping apart from mom and dad. 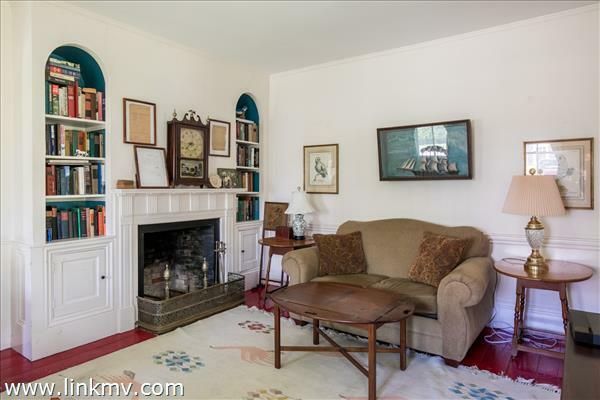 The current owners have created a magical Chappaquiddick setting for the next owners to enjoy. Premier location on the north side of the village. 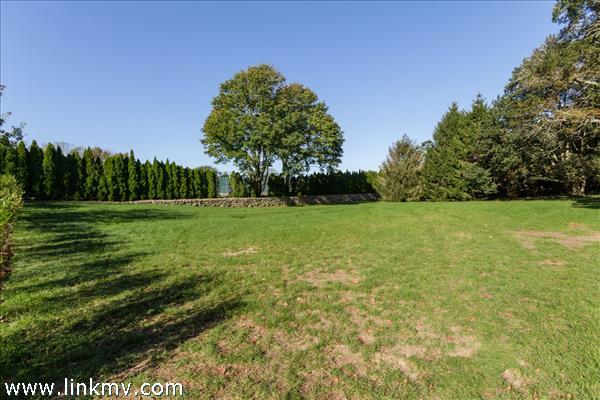 This sprawling property has so much to offer. 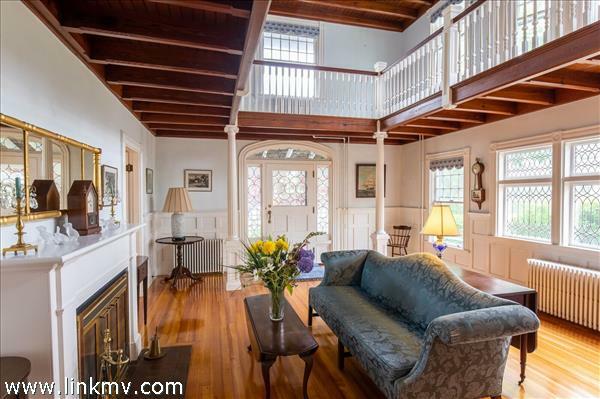 The main house has impressive historic details including a dramatic Great Room with an interior mezzanine balcony and a 23'-high ceiling featuring backlit 1920s-era stained glass. 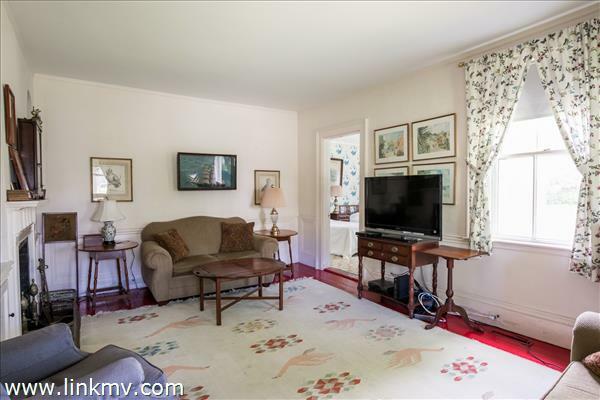 There are four bedrooms and two and a half baths in the main house. 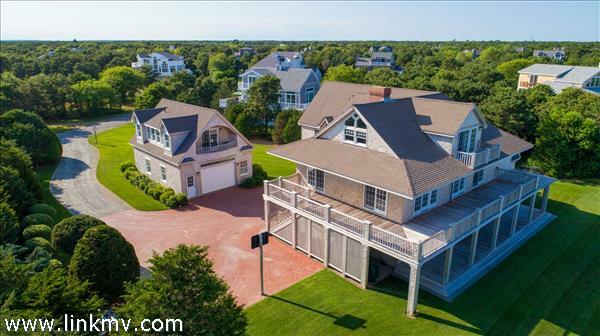 The oversized guesthouse has two bedrooms and one and a half baths plus a large living room spread out over 1000 sq ft. There is a spacious private lawn shaded by a majestic copper beech tree estimated to be over 200 years old. Privacy for the guesthouse is accentuated by its separate entrance off North Summer Street. The charming bunkhouse known as the "Sugar Shack" is tucked in the corner of the lot. All the charms of the village are but a short distance away, including Fuller Street Beach, stores, restaurants, and the Yacht Club. 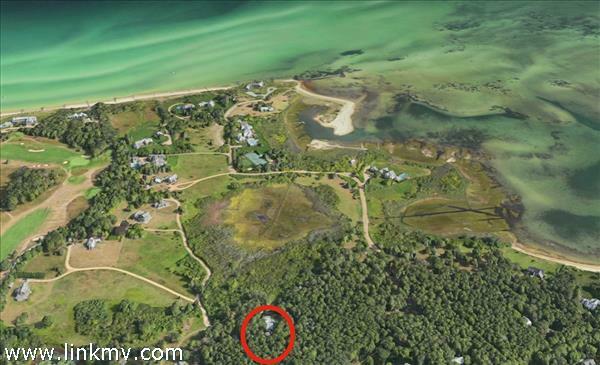 The property offers wide scope to create a compound in one of the island's most distinguished enclaves. 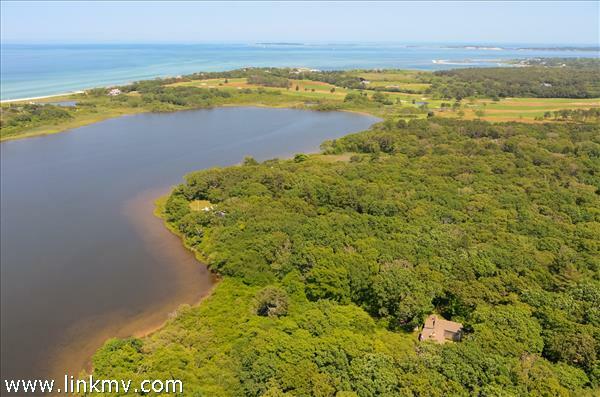 Over 10 special acres stretching from Beach Road to the waters of Trapps Pond - all less than a mile away from Edgartown village. 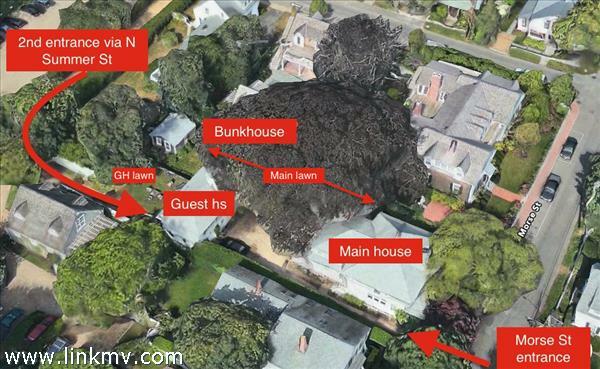 This property is sub-dividable (proposed plan available upon request). The cottage at the water's edge is charming, and from just yards away from the deck you can set off to explore the pond by kayak, paddle-board, or dinghy. The birdlife here is extraordinary, and so are the sunsets over the barrier beach from Nantucket Sound. 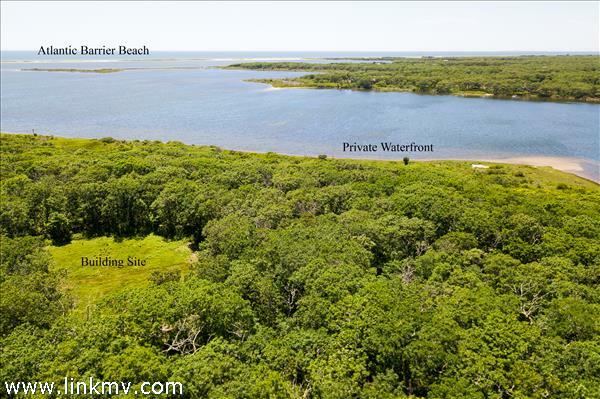 This waterfront property will be the setting of family memories for generations to come. In-town charmer. 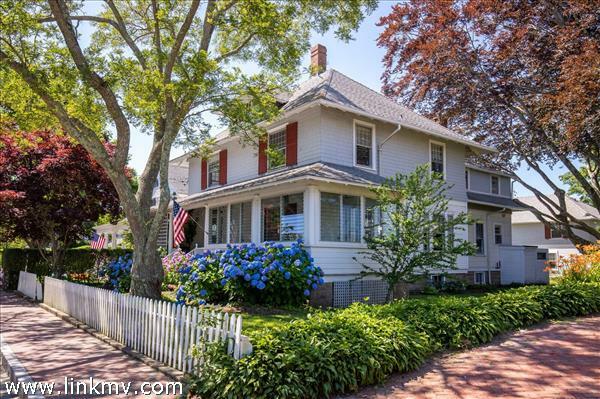 This 5-bedroom Victorian is located on a quiet street of multimillion-dollar homes, and represents an opportunity for the buyer seeking entrée into one of the island’s most distinguished neighborhoods. 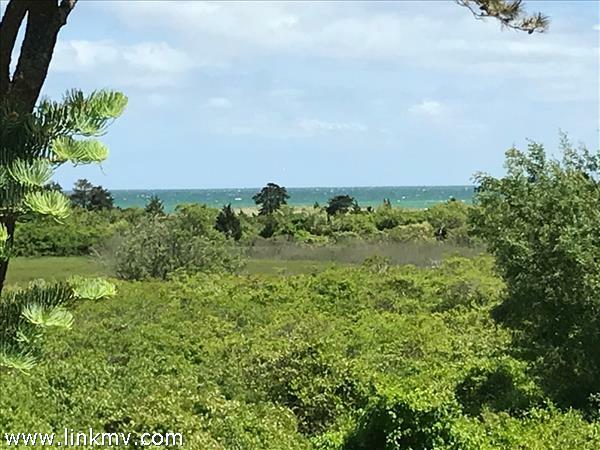 Tucked away from all the hustle and bustle of village living yet it is an easy stroll to Edgartown Harbor, shopping, restaurants, and Fuller Street Beach. With one-third of an acre of land, there are plenty of options for the future owner, whether it involves a major renovation and/or addition, swimming pool, or new construction. Experience village living in one of New England’s most charming communities. 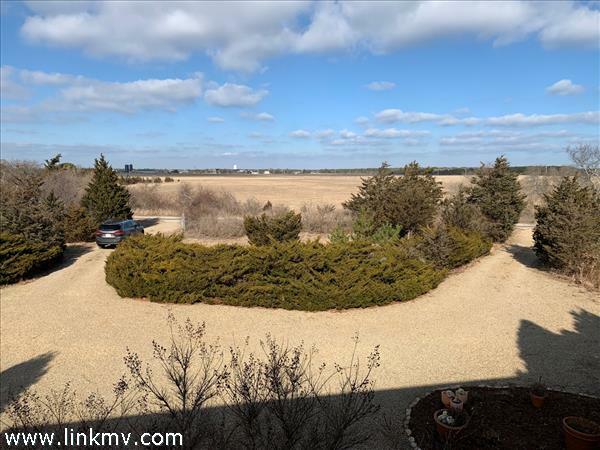 An unusually large parcel of raw land, just under 3/4 acre, in the Village with a most gracious presence down a long drive from Pease’s Point Way. Development options abound with up to 7 bedrooms possible, a pool and other accessory structures. 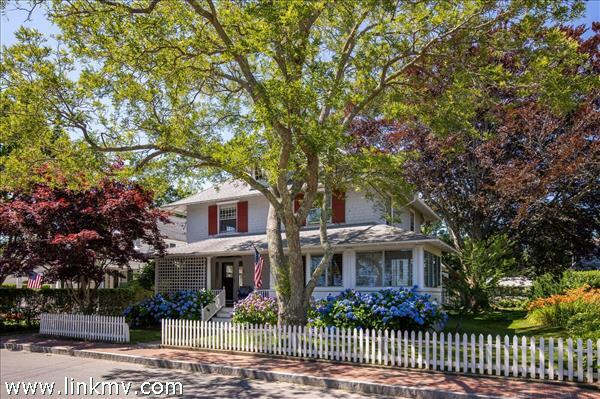 A rare chance to create a prominent compound just blocks from Eel Pond, Fuller Street and Lighthouse beaches, the harbor and Main Street shops and restaurants. 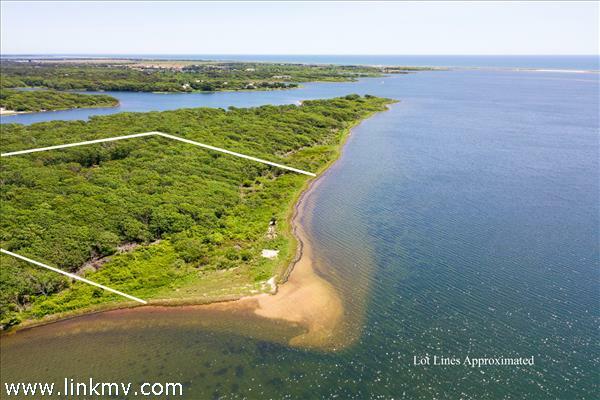 Set beautifully on the southwest part of Kanomika, a prominent peninsula on the Edgartown Great Pond, this prime waterfront parcel is the ideal place to create your dream residence. 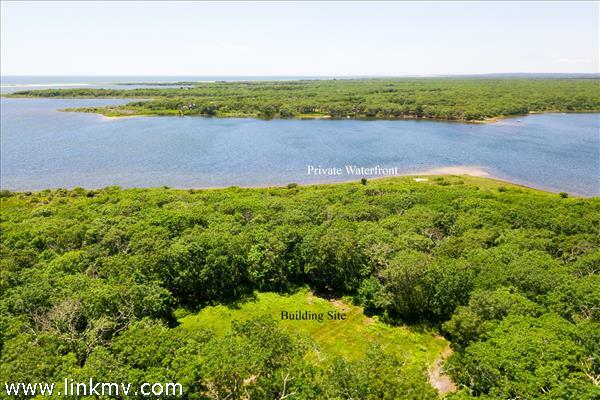 With over 6 acres and approximately 500’ feet of waterfront, the property includes one of the most sandy stretches on the Pond and a southwesterly orientation which provides rare potential for sunsets and spectacular water views toward Swan Neck and dunes in the distance. 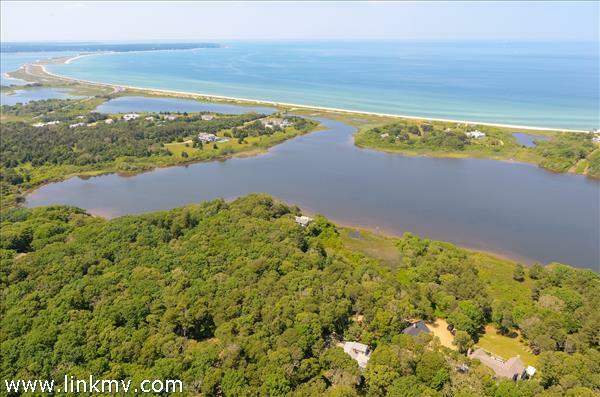 Launch a boat to enjoy beach on the Atlantic, or swim or sun along your own private shoreline. 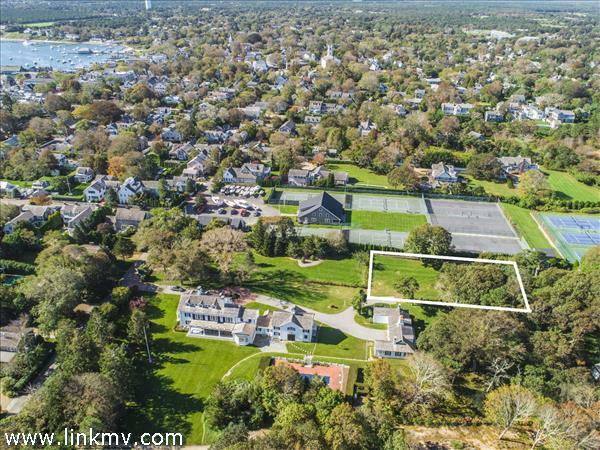 Perfectly located on the waterfront, the property includes access to a shared tennis court as part of Kanomika - a private neighborhood with protective covenants and waterfront lots of 4 acres or more. 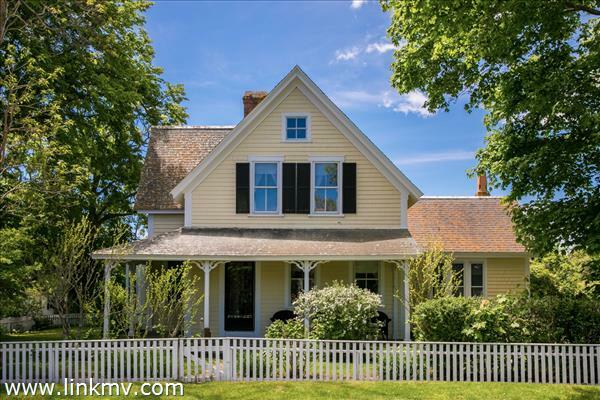 Convenient to downtown and Katama, the area is characterized primarily by forest and gently sloping topography and the approach, off Meetinghouse Road, crosses a sprawling meadow that is under conservation. 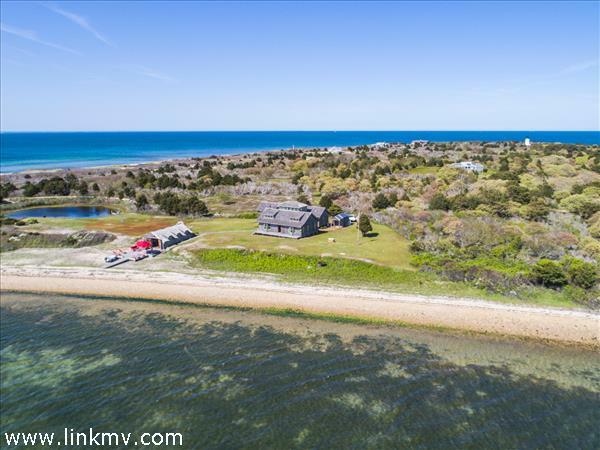 Bring your architect or builder and express what home on the Vineyard means for you in this most pristine and natural locale. 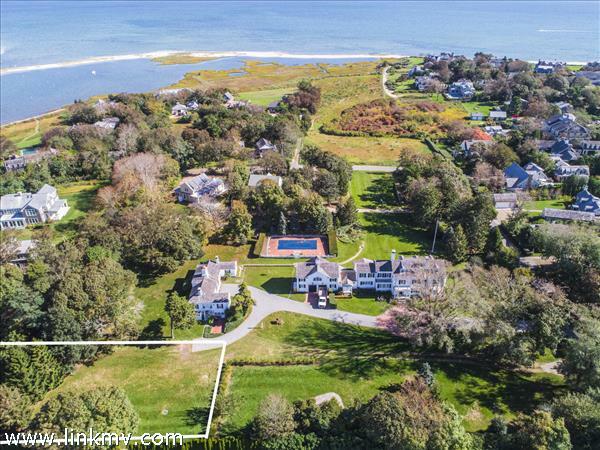 Nestled on a quiet lane in one of Edgartown's most distinguished enclaves just half a mile to the village, this 2.8 acre lot off Planting Field Way offers the opportunity to build a dream compound with house, guesthouse and pool. 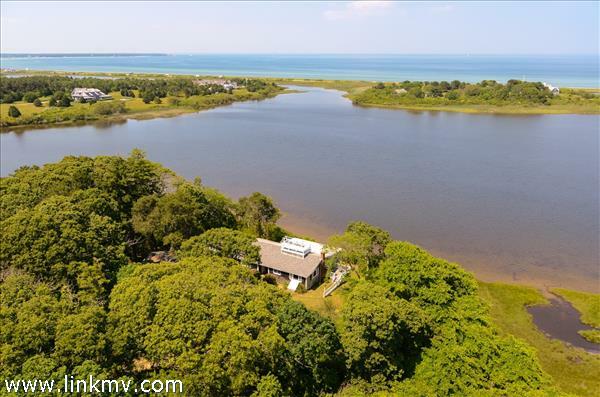 There are charming second story views of Nantucket Sound over conservation land owned by Sheriffs Meadow. 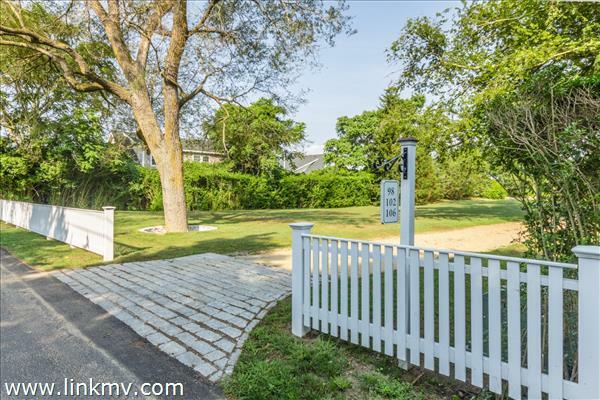 The existing house and garage on the property are usable but will inevitably make way for improvements commensurate with the value of the land in this area of multimillion dollar homes. 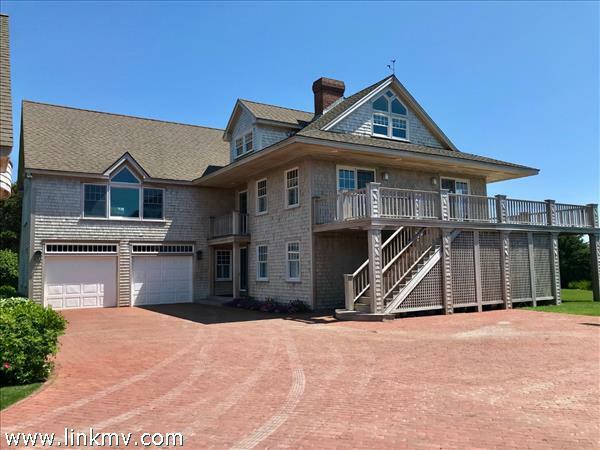 Tucked between the calm waters of the bay and the Atlantic Ocean, under the guard of the Cape Poge Lighthouse, rests a retreat like no other. 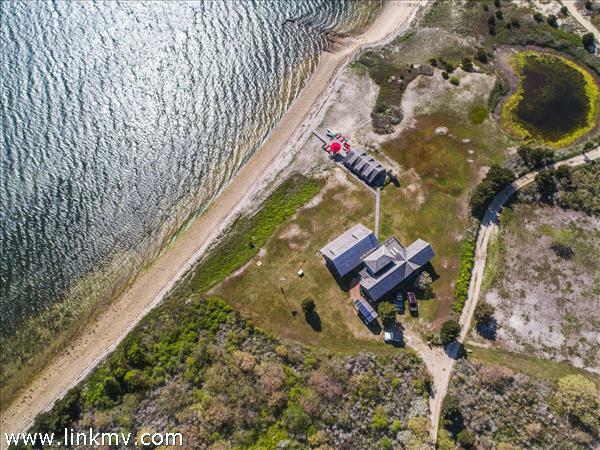 Lovingly restored and meticulously maintained, the three bedroom main house and one bedroom boathouse offer all the amenities one would expect, but not necessarily anticipate, from off the grid living. The ideal lifestyle choice for water sport and outdoor enthusiasts alike; with boating, kayaking, kite surfing, and shell-fishing at your doorstep, or for those seeking refuge and relaxation from the bustle of everyday life. Protected by the surrounding 500 acres of conservation, and accessed only over sand or by sea, this truly is the greatest escape. 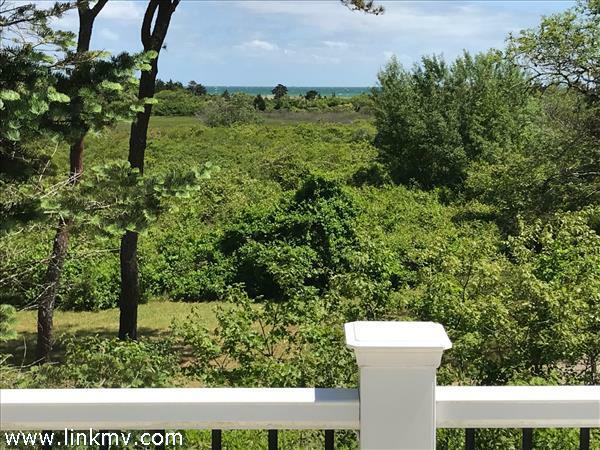 KATAMA -- See the ocean in the distance, hear the ocean and -- you're just a short walk to South Beach! 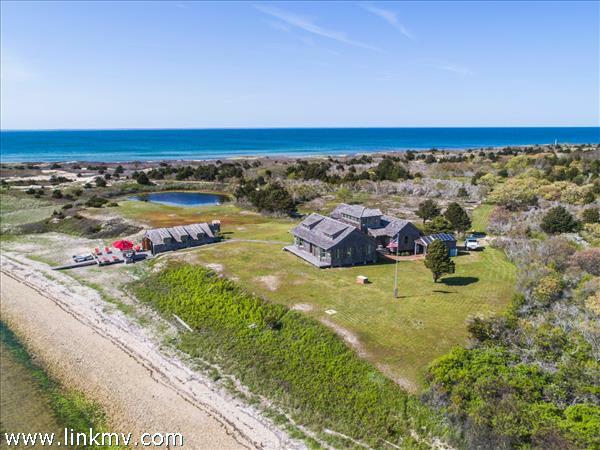 Set in one of the most sought-after areas of Katama, this large, two story, 4-bedroom, 3 ½ bathroom beach house, is located on a 1.6 acre lot affording complete privacy. 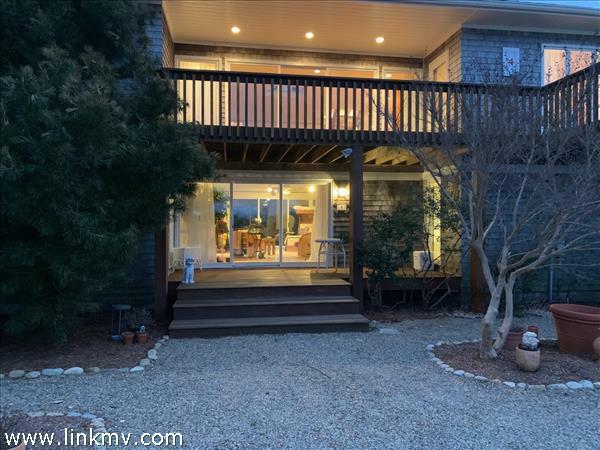 Wrap around second floor deck (1,524 sq ft.) connects main house to 2-car garage with oversized (616 sq. ft.) loft above (not included in sq. ft. living space). Spacious interior living areas, with great flow to outdoor entertainment areas. Mini-split A/C and electric heat makes this a great vacation or year-round home. 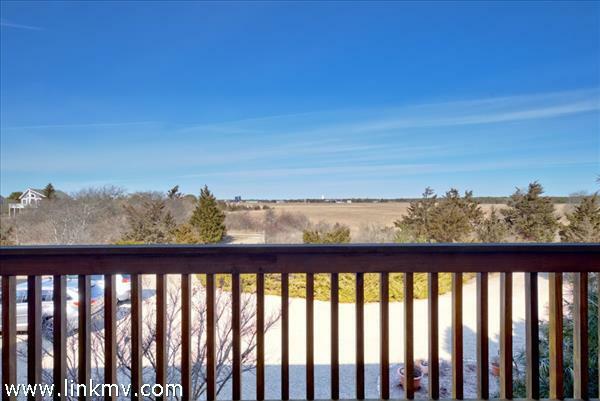 Rooftop deck offers 360-degree, partial water views on one side and Katama farm on other side. Semi-circle drive has parking for multiple vehicles. 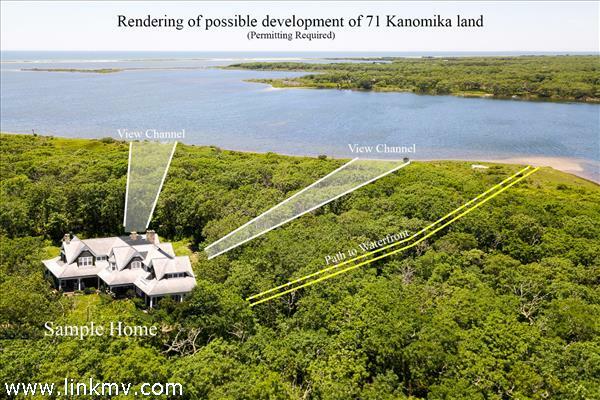 A must see if you’re looking for Katama, close to the beach! 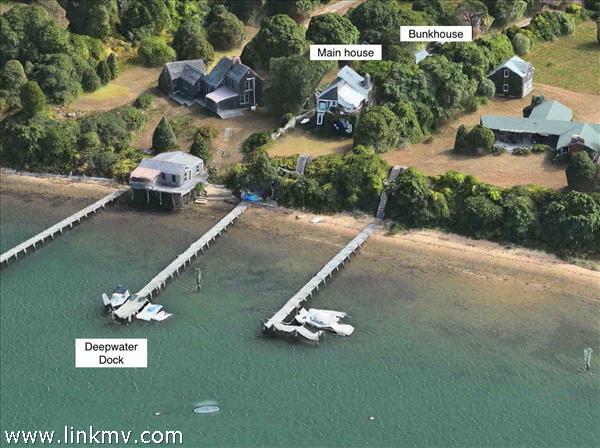 Property is conveniently located near the bus stop at the bottom of the street, the oversand vehicle access to Norton Point, and the town pier is only a short ride away. 4-Bedroom Title V passed inspection April 2017. 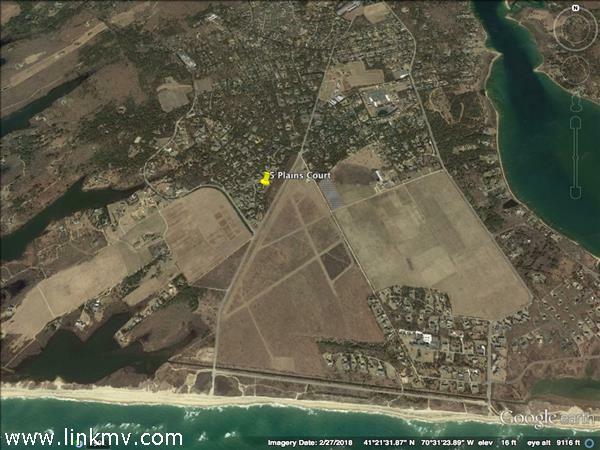 Lot size allows plenty of room for a pool, but check all such plans for approval with appropriate town departments. All showings must be pre-qualified buyers. NEW CONSTRUCTION, 4,304 sq. 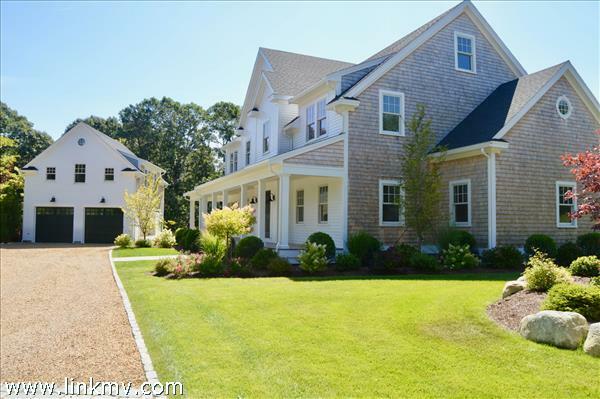 feet of custom designed living on Jordan Way, neighboring the Edgartown Historic District. The open floor plan features an open kitchen, dining and living room with a fireplace that overlooks the outdoor area. The first floor features a mudroom with laundry, home office and first floor master suite. The second floor has three bedrooms all with private baths. Added to this property is a detached two car garage with a downstairs half bath, and a full bath and guest bedroom upstairs. Professional landscaping adds to the character of this property. The backyard offers plenty of ROOM FOR A POOL. This custom-designed tri-level home sits on over a ½ acre in a desirable Katama neighborhood, minutes from South Beach. 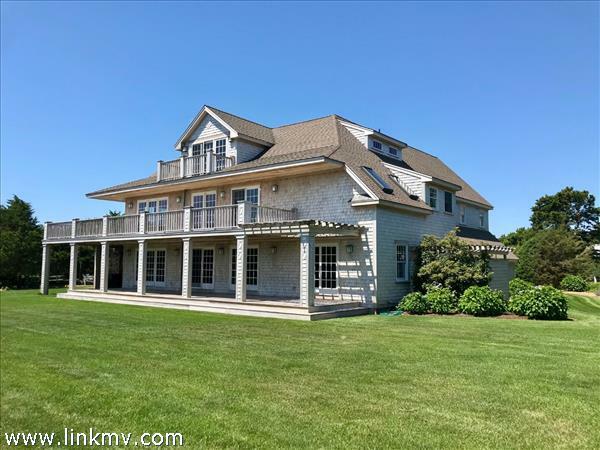 With over 4,200 sq feet of living space, the main house provides 3 bedrooms, 4.5 baths, an open floor plan on the main level, and a spacious Epay maintenance-free deck with wide views of the Katama Airfield. Entering on the ground floor will bring you to a casual living room with wet bar and sliding doors to the covered deck and landscaped lawn, a spacious guest suite with full bath, a bonus room/office and a full hallway bath. The second/main level is designed with open kitchen, living and dining areas. 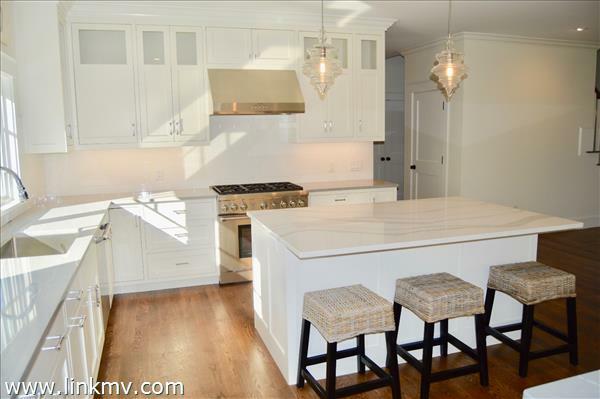 The gourmet kitchen features cherry cabinets, granite countertops and top of the line appliances. 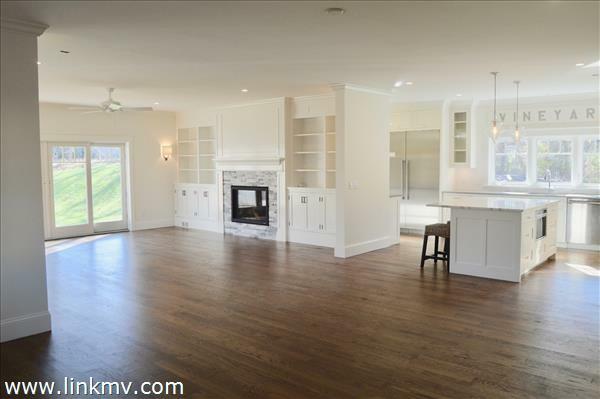 The adjacent living room boasts a large gas, stone fireplace and takes advantage of 5 sets of sliding doors leading to the sunny deck – perfect for entertaining, grilling and dining. Rounding out this floor are the master suite with vaulted ceilings and a full bath, a powder room with a hand-painted Margot Datz mural, and a business office. Heading up to the third loft level with hardwood floors, vaulted ceilings and a petite balcony provides additional space as a rec room, bunk room, studio or office. In addition to the two-car attached garage is a nicely designed detached garage that was built in 2004. The finished space above with a full bath and balcony, compliments this already feature-rich property. 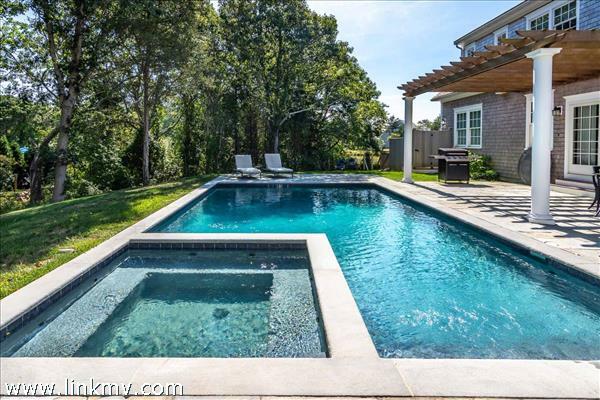 Yes, there is room for a pool amongst the impeccably landscaped lawn.